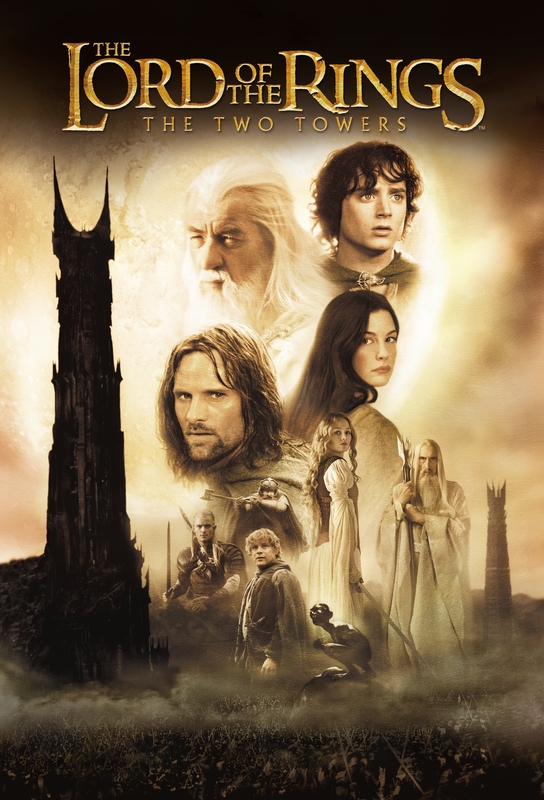 Synopsis: Continuing the journey as the Fellowship breaks apart, as Frodo and Sam continue their journey to Mordor to destroy the Ring. The trio of Aragorn, Legolas and Gimli make a stand against Sauron’s puppet Saruman and his armies who seek to destroy the world of men. THE FOLLOWING REVIEW CONTAINS FELLOWSHIP OF THE RING SPOILERS! YE BE WARNED!!!! Review: The middle mark of a trilogy, sometimes one that tops its predecessor in glorious fashion, improving every element and every aspect. Or a miserable failure that is often lost in the movie wilderness, never to be spoken about again. Okay there might be middle ground between these two, but in the case of the second chapter in the trilogy of Peter Jackson’s Lord of The Rings, neither really applies. The first film was a masterpiece in fantasy storytelling, with wonderful characters and a superb adventure that kept the audience glued to the screen for three and a half hours, and that trend continues on into The Two Towers. The story picks up immediately after the end of the Fellowship of the Ring. The Fellowship itself has disbanded, with the death of the heroic Boromir and after Gandalf fell into shadow. Frodo and Sam continue onto Mordor to destroy the One Ring. Merry and Pippin are captured by Urak Hai and the remaining trio of Legolas, Gimli and Aragorn set out to rescue them. With three strands of the story line, the trilogy continues to thrill in all of its spectacle and brilliance as our journey into the wonder and yes indeed terror of Middle Earth continues as we explore new parts, in particular the land of Rohan and their battle to stop the treacherous White Wizard, Saruman from exterminating the world of Men. Fellowship introduced us , for the most part, to our key characters. However, this chapter adds some new and important characters into the picture. Namely, Theoden (Bernard Hill) his niece Eowyn (Miranda Otto), Faramir (David Wenham) and of course, the creepy and sinister Gollum (Andy Serkis). All of these new characters are key additions to the story and all are portrayed excellently, with Eowyn giving the series a strong and very capable female warrior, a rarity in Middle Earth sadly. but the most stand out of all of these is Andy Serkis’ motion capture portrayal of Gollum. Gollum is one damaged and wounded creature, and Serkis generated quite the buzz with his performance, with there being talk of a potential Oscar for his work. Gollum’s arrival splits Frodo and Sam’s relationship in half, as Sam harbours strong suspicions of Gollum’s true motive. All the while, the burden of the Ring is really eating away at Frodo and taking a severe toll, thus meaning Sam needs to come to the fore, and he does so brilliantly. The acting from Astin and Wood goes up a gear here, but Serkis absolutely steals the show for his work as Gollum. On the other side of the world, Aragorn, Legolas and Gimili, aided by a rejuvenated Gandalf the White, are preparing for the fight to stop the villainous Saruman to wipe out Rohan via a considerable army of Urak-Hai. They’re a very unlikely trio but they have great chemistry between them. Through this we are eventually led to the Battle of Helm’s Deep, and what simply is one of the best and most epic battle scenes ever put on the big screen, though some great action scenes do come before it. Whilst at the same time packing humour aplenty with the increasingly amusing relationship between Legolas and Gimli which culminates in a battle within a battle, to get the most kills. It is uproariously entertaining whilst at the same time very gripping, edge-of-your-seat action. Yet for all those epic battle scenes the scenes with Merry and Pippin and Treebeard, their Ent, tree like companion, can feel very slow and tedious at times. , However while it maybe slow to sit through these scenes, the pay off is certainly worth it. The cinematography, visual effects and score remain as brilliant as they were in the first movie. The respective story lines do have some satisfying conclusions and the film closes at a perfect point to set it up for the concluding chapter to this magnificent trilogy. The prospect that Lord of the Rings could have been only two films is one that does not bear thinking about, as who knows what would have been butchered from the story to make it into two films. Luckily for us all it did not come to pass and we got our trilogy. For some, Two Towers marks the low point of the trilogy, but it does not bring the movie down at all from being the awesome and thrilling adventure that it is. There are some great pay offs in the respective arcs, but there is enough hanging in the balance to draw the viewer back. Jackson pulled it out of the bag again, and in spectacular fashion my precioussssssssssssssssssssssssssssss. Though not as action packed as Fellowship was, it provides more character development, more heart, and with one of the best battle sequences ever put on the big screen, the journey continues in majestic and magnificent fashion.